Yes, you read that right. Instead of jumping feet straight back…they jump at an angle to the side. The more flexibility you have the better you can try these! Alternate sides, and yes you still drop down to the ground :) One side will work more than the other– so do both sides! You can use a weight or band on these– on triceps you would put band under both feet, and take arms straight back and down to hips (arms stay straight) for shoulders, sit on the band and press overhead. You can also modify to use no equipment and put tricep dips, squats, push ups in place of the weight-bearing exercises. 5 burpees, just a few times throughout this weights only (or band) workout! Can be done outside, or inside. Outside use a field, longer driveway, etc to run, you can also jump rope if you have less space! First, I promised a big group of you I would share wedding pictures here when I got them! Here they are. Is a healthy Halloween possible? Of course Halloween can be a scary time of year for parents that want to keep their little ghosts & goblins away from mountains of refined sugar. Being surrounded by so many sweets can make this a challenging holiday for many people and their families. Even those with the best intentions can be at risk for over-indulging. Unofficially, Halloween is the start of the holiday feasting season. Many families start giving in to the urge for sugar filled foods around this fun holiday, which starts a trend that lasts all the way through the New Year. According to the National Confectioners Association each Halloween $2 billion dollars are spent on candy and nearly 93% of children in the United States go trick-or-treating, thus fueling the fires of the childhood obesity epidemic that is currently an unfortunate and grave reality. Halloween isn’t going away, but you can learn how to deal with this overabundance of candy and incorporate treats in a reasonable way. An all out candy prohibition will only make it more enticing and could set up a potential “candy overdose”. Halloween doesn’t have to be the start of a downward spiral of unhealthy habits. Families can have plenty of fun and yum without all the sugar! 1. Don’t buy candy until the day of Halloween. Avoid having candy around weeks prior to the sweets frenzy. It will also make it more special to wait when the time comes to savor and enjoy some pieces of your favorite kind. 2. Find healthy versions of treats. Look for healthier chocolate and candy to pass out to trick-or-treaters at your local health food store. Finding chocolate treats that are at least 70% pure cacao instead of the processed milk chocolate, is easy to do, and the taste is out of this world. 3. Avoid the traditional candy items. Give out crayons and coloring books or other crafty treats that will spark creativity in a kids mind. 4. Feed your kids before they go out. Make sure your kids eat a healthy balanced meal before they go trick-or-treating. They will be less likely to consume candy all along the way. 5. Practice the 90-10 rule. Limit their sugar intake after the big night and only allow a certain number of items per day. Feel free to throw it out after a certain amount of time, if you feel that there’s too much on hand. You are the parent after all. 6. Getting the kids moving. Make sure the kids get plenty of exercise before trick-or-treating. 7. Do the monster mash. Have a Halloween party instead of the usual trick-or-treating. You will be in control of all the treats that you serve, making sure the sugar load is kept to a minimal. 8. Plan other fun activities. Do something that isn’t focused on collecting candy. Go on a hay ride, pumpkin picking, or a haunted house. Carve the pumpkins and bake the seeds for a healthy snack. 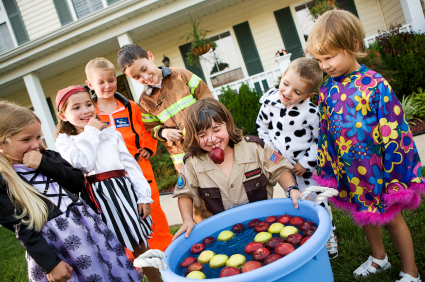 Go bobbing for apples, or make a mini-scarecrow and other spooky decorations for your house or front yard. 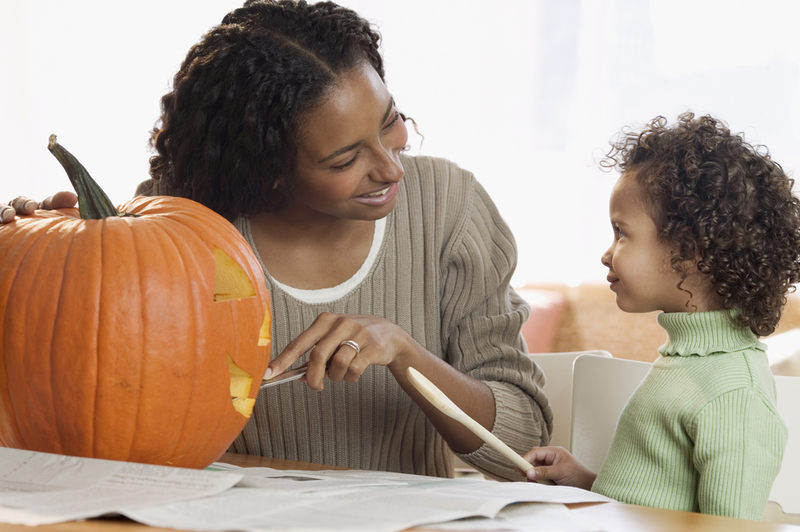 There are plenty of other things that you can do with your kids to have a fun, and healthy Halloween. 9. Limit the amount of time spent trick-or-treating. This will decrease the amount of candy that has to be negotiated. Take the time to enjoy your community and plan a post-trick-or-treating party (candy-swap to weed out favorites), return home to watch a Halloween movie, play games or make crafts. 10. Share or donate candy. This overabundance of candy can give kids an opportunity to learn how to share and think about other people less fortunate. 11. Make small baggies. Give kids reasonable portions of candy for a few days following Halloween. SHARE! What are your ideas about a healthier Halloween?